It’s amazing to think that in this day in age there are still some companies out there relying on the old paper books to do their accounting. Today, computerized accounting software is not only extremely affordable, but immensely faster, more accurate, and just overall more efficient. There are two powerful accounting software packages dominating the market right now: QuickBooks and MYOB. Both are outstanding pieces of software to make your accounting processes faster and more reliable. Accounting software offers a tremendous amount of benefits for medium to small businesses, and the software mentioned before is more than capable of doing the job. Your business is certain to never go back to the traditional paper systems. 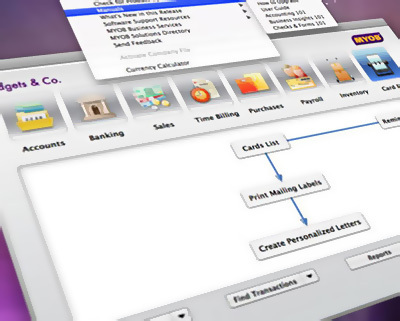 Computerized accounting systems offer advantages such as automatically updating customers’ accounts, recording invoices from suppliers, making payments to suppliers or for other expenses, automatically adjusting stock records, automatic payroll calculation, and much more. Either one of these pieces of software will do the job of automating and simplifying your accounting. The latest versions of both are absolutely top-notch. They are both very easy to use, look great, and are rich in features and reporting capabilities. Every time these companies put out a new version of their software, we always see improved automation, the ability to enter data faster, better use of technology, more features, better reporting, and increased flexibility. In 2009, Quicken, the company that produces QuickBooks, put out a cloud-based version of QuickBooks. This gives QuickBooks online capability, allowing networking between accounting computers. MYOB has also released their own cloud version, but only recently. In terms of cloud software, QuickBooks is certainly the most feature rich, however. They are both available at a very affordable price for any small to medium business owner. The truly great thing about QuickBooks is that they fully automate your accounting services. Not only are they loaded with terrific features that will have your books rock solid, they’re rather easy to use, especially with the proper training. They aren’t just resting on their laurels either, continually upgrading their services to make the accounting process even smoother. Once you have one of these systems, you’re investing in a continually expanding product. For companies in Singapore, taking on one of these systems won’t only increase your accounting productivity. Under the country’s Productivity and Information Act, you can claim the purchase and training of these programs. Not only will you be significantly increasing your accounting operations, you’ll be saving money by doing so. Companies like Wecount can make this happen for you. Consider what features your business may need when deciding between either software package. Either way you go, the advantages you’ll have as a result will leave you in awe. Any transaction recorded only needs to be recorded once, unlike doing an old fashioned manual entry where you may have to make two or three entries. Computerized ledger systems are fully integrated, meaning any business transaction entered is recorded in many different accounting records simultaneously. Data entry also becomes much faster and easier using built-in customer databases which are easy to custom tailor to the needs of your business. Any data entered can be made available to multiple locations at the same time. Invoices are created faster and more accurately; purchase orders, payroll documents, credit notes, and printing statements can now be completely automated. Your accounting can become much more efficient, saving valuable time and resources, and improve overall cash flow. All in all, if you have not computerized your business’s accounting, it is certainly time to consider doing so. Consider what your business needs to figure out if Quickbooks is the best fit for you and your team. If you’re still operating the old fashioned way, you’re throwing away precious time by doing manual entries. With QuickBooks, you can cut down on the time since transactions only need to be recorded once instead of the two or three times it takes under your current system. As a matter of fact, for high volume businesses, you can be cutting your accounting time in half through taking on a computerized system. When you bring in secretarial services in Singapore like Wecount to help with your bookkeeping, you aren’t just getting a third party to run your books. You’re getting company secretarial services in Singapore that will train your current employees on the use of the new computerized software. Your Singapore secretary will work with you to ensure that you’ve selected the right program for your company’s individual setup, then get to work in training your employees on how to use it. And don’t forget that you can claim in all under the PIC Scheme! Kick up your productivity and accounting practices by hiring a corporate secretary Singapore like Wecount to integrate the right software and training for your company.